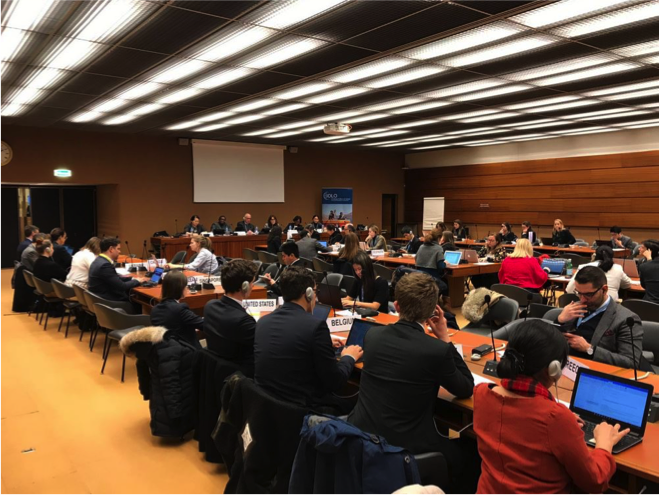 Humanium was there at the Palace of Nations in Geneva to witness a fundamental problem concerning the rights of the child, namely access to justice. Access to justice for children is both a right and a means to restore the rights that have been violated. Without effective access to justice, children remain vulnerable to abuses from their family environment, from society, or even from the state. 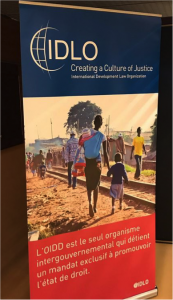 In its objective to promote the Rule of Law, the International Development Law Organization co-organized, this Monday February 4, 2019, a round table on the subject “Access to justice for children and young people “. – Ms. Diahann Gordon Harrison, Children’s Advocate of Jamaica and National Rapporteur on Trafficking in Persons. – Mr. Dunstan Mlambo, Magistrate, President of the Supreme Court of South Africa. – Ms. Aijan Muktar, Swiss Youth Delegate to the United Nations. – Ms. Mikiko Otani, member of the Committee on the Rights of the Child. The speaker explained the authority of the Children’s Advocate of Jamaica, such as introducing judicial proceedings, having powers of investigation, the possibility of being mandated to sensitize the adults and the children themselves on children’s rights or on other problems that may affect the rights of the child. With regard to her role as Special Rapporteur on Children’s Justice, she explained that she had a particular role at the national level with regard to human trafficking in Jamaica. In this transit country, women and children are the main victims, and girls are the majority among the victims. They are also marginalized in poor neighborhoods, affected by unemployment and lack of schooling. She explained that the national rapporteur helps coordinating and organizing national campaigns between various actors such as government representatives, NGOs, immigrants, social platforms, and victims. The national rapporteur also ensures that children have an education and that victims of trafficking can lead peaceful lives after their freeing. Another question put to Mr. Dunstan Mlambo concerned access to justice for minors in the Constitution of South Africa. The President of the Supreme Court specified that the Constitution contains a section about children which includes the right to be represented by a legal practitioner. In addition, there is the Children’s Act of 2005, which includes judicial aspects on the rights of the child and child protection. It also specifies that customary law must be in accordance with the Constitution, which in theory limits the possibility of child marriage or other customary practices. As a youth delegate from Switzerland, Aijan Muktar is in charge of promoting the interest of young people in Switzerland. One of the problems she faces, in terms of access to justice for minors, is the fact that the law, in its very formulation, is sometimes difficult to understand. She argues that the law must be more accessible, especially through social media, and also through the different events that young Swiss representatives at the United Nations organize, such as workshops on the International Convention on the Rights of the Child or awareness campaigns for children about the rights they enjoy. Finally, Ms. Ottani, member of the Committee on the Rights of the Child, responded that the obstacles to access to justice for children are numerous, because of their vulnerability, because some live in outlying rural areas, because some have disabilities, and because some are ethnic minorities. Lastly, she pointed out that, in the context of the work of the Committee on the Rights of the Child, although it was not usual to use the term “access to justice”, it was nevertheless understood that when the Committee referred to the term “children’s participation,” it meant “access to justice.” She concluded that the strengthening of the Rule of Law but also the achievement of the Sustainable Development Goals (SDGs) would allow for the development of human rights, and better access to justice, especially for children. The participation of NGOs (UNICEF, UN Women …) and member state delegations in the debate was also relevant. This resulted in greater consideration of gender equality for access to justice and of local and regional intervention. It also helped ensuring that states ratify international instruments promoting greater access to justice, and that they allow for judicial procedures adapted to minors. – Access to justice for children is not only a right, but also a means to restore violated rights of the child. – Access to justice for children must take into account their particular vulnerability. – Cooperation is needed between government representatives and local actors (NGOs, civil society, families, the children themselves). – Accessible justice for children includes efforts to make the law more inclusive (social networks, workshops, animations).